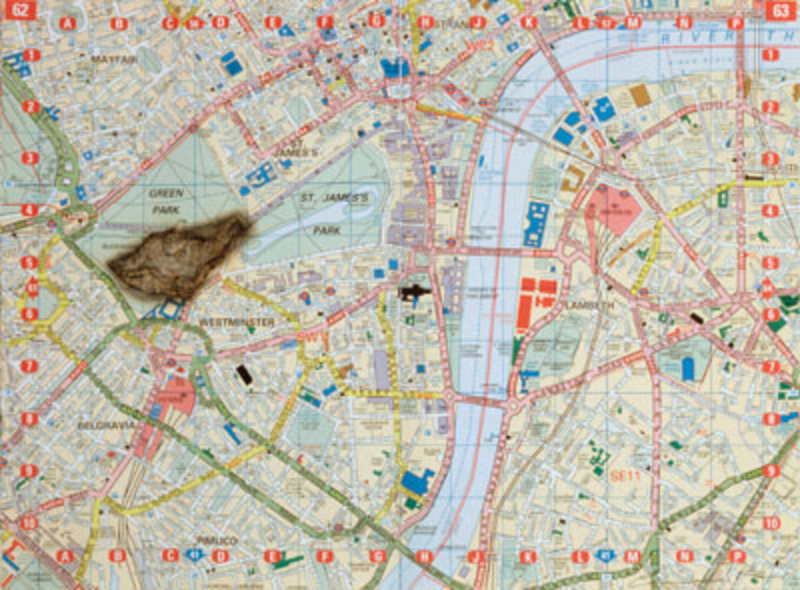 Cornelia Parker, Meteorite Lands on Buckingham Palace, 1998, maple-box-framed map of London and burn left by meteorite, 21 1/4 x 27 1/6". The opening chapter of Thierry de Duve's 1998 Kant After Duchamp—which inspired this offbeat group show—is a rare example of art theory as seen through the eyes of a Martian anthropologist. Here, that approach gets refashioned as a curatorial principle: Aliens, we're told, have acquired some 150 works by practitioners as diverse as Cai Guo-Quiang, Thomas Hirschhorn, and Cornelia Parker, and have categorized their artifacts according to presumed function rather than the earthly codifications of contemporary art. This sculpture-dominant exhibition—a quixotic synthesis of H.G. Wells and Marcel Broodthaers—is propelled by serious intent, however. According to the curators, the misprision of the show will reflect how Western anthropology has assessed non-Western cultures, turning the tables by imposing otherness on our own.